Alter Bridge in 2017, from left to right: Scott Phillips, Brian Marshall, Myles Kennedy, Mark Tremonti. Alter Bridge is an American rock band from Orlando, Florida. Formed in 2004, the group includes lead vocalist and rhythm guitarist Myles Kennedy, lead guitarist and backing vocalist Mark Tremonti, bassist Brian Marshall, and drummer Scott Phillips. After their former band Creed became inactive in 2003, Tremonti and Phillips formed a new group with former bandmate Marshall and new vocalist Kennedy, most recently of The Mayfield Four. The group was formally unveiled in January 2004, months before Creed's official breakup in June. 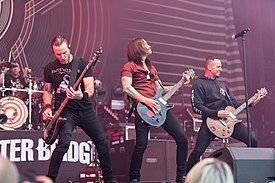 Following continued activities with the members' other bands, Alter Bridge released AB III in October 2010, which achieved critical acclaim and commercial success, on Roadrunner Records, with the album's lead single "Isolation" topping the Billboard Mainstream Rock chart. Alter Bridge released Fortress to further acclaim in September 2013, as the band's members continued splitting their time between various projects. The Last Hero followed on Napalm Records in October 2016, becoming the band's first album since its debut to reach the top ten of the Billboard 200, and its first to reach the top five of the UK Albums Chart. Alter Bridge lead guitarist and founder Mark Tremonti, bassist Brian Marshall, and drummer Scott Phillips were members of the rock band Creed with lead vocalist Scott Stapp since 1993. After releasing two successful albums, My Own Prison (1997) and Human Clay (1999), Marshall left the band in 2000, followed by the release of their third album, Weathered, in 2001. The band became inactive in 2003 following the conclusion of a controversial tour. That year, Tremonti began writing new material with plans of forming a new band with Phillips and Marshall. Being fans of Myles Kennedy's former band, The Mayfield Four, they invited him to join as their new lead vocalist. They named the new band Alter Bridge, after an actual bridge near Tremonti's home on Alter Road in Detroit, and subsequently began recording their debut album. Citing creative differences and increasing tension between Stapp and the other band members, Creed broke up in June 2004. Coincidentally, Alter Bridge released their debut album and the single "Open Your Eyes". The band members felt as if Creed had "run their course" and were determined to focus on their future with their new singer. Alter Bridge's debut album, One Day Remains, was released on August 10, 2004 by Wind-up Records and received mixed reviews. Produced by Ben Grosse (who has also produced albums by artists such as Filter, Fuel, and Sevendust), the album sold 750,000 copies worldwide and achieved gold status. It peaked at No. 5 on the Billboard charts for fourteen weeks. After "Open Your Eyes," two more singles were released from the album in 2005: "Find the Real" and "Broken Wings." Also, partially due to the fact that the album was almost finished by the time Kennedy joined the band, it is the only Alter Bridge record that does not feature Kennedy as a guitarist, although he did play guitar on several songs on the album's accompanying tour. The music was composed completely by Tremonti, who had also written most of the lyrics by himself, though Kennedy wrote or at least co-wrote the lyrics for about half of the remaining songs. Several songs from One Day Remains established an affiliation with WWE. Most notably, "Metalingus" was adopted by wrestler Edge as his entrance theme in 2004, and it was used as such until his retirement in 2011. Alter Bridge would later appear with Edge in a backstage segment on an episode of WWE Raw in 2005. An edited version of "Open Your Eyes" was used in the video game Madden NFL 2005. Alter Bridge released a rare instrumental song called "Ahavo Rabo Taco Salad" for Total Guitar magazine in 2005. It was solely a Mark Tremonti song originally, but the rest of Alter Bridge soon got involved. A song called "Save Me" was included on the soundtrack for the 2005 Marvel film Elektra. The soundtrack for another 2005 Marvel film, Fantastic Four, also featured an Alter Bridge song, "Shed My Skin." That same year, the band released a four-song EP called Fan EP as a promotional CD in Europe. 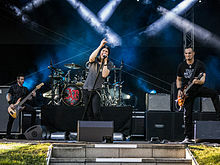 Alter Bridge's relationship with Wind-up Records, who did not share the band's vision, began to deteriorate when band members began hearing rumors of the record label deciding not to release singles or promote the album as promised. The band had been asking to be released from the label shortly after the release of One Day Remains, but their request was consistently declined. Some time before 2006, Alter Bridge & Wind-up Records were "finally able to negotiate terms acceptable to both sides". All recording, publishing, and merchandising agreements were finally terminated. The true nature of the agreement was later described my Mark Tremonti in a LoudWire interview as "being screwed over", where he revealed that Alter Bridge had to “buy out” their agreement for an undisclosed sum, for which they were still paying off. However, Alter Bridge continued to face difficulties, including criticism for disbanding Creed, pressure to reform Creed, and numerous false reports of a Creed reunion, in addition to some critics describing Alter Bridge's music as sounding like "Creed with a different singer." Despite Creed later reforming in early 2009, Tremonti responded to these claims by stating that "Creed will never exist as a band again." Alter Bridge toured extensively in promotion of 2007's Blackbird. In 2007, Alter Bridge signed a record deal with Universal Republic Records. Tremonti said of the band's new material, "I think it's the best work we've ever done." Alter Bridge's second album, Blackbird, featuring the successful singles "Rise Today" and "Watch Over You," was released on October 9, 2007. "Watch Over You" was featured in VH1's Celebrity Rehab with Dr. Drew in 2008 and its music video featured clips from the series. Another version of the song featuring Cristina Scabbia of Lacuna Coil is available in the United Kingdom. Blackbird received very positive reviews from critics, and currently holds an average of 9.4 out of 10 on Ultimate Guitar Archive. The album also featured the critically acclaimed title track, the guitar solo of which would later be lauded by Guitarist by reaching No. 1 on their 2011 list of the greatest guitar solos of all time. The band embarked on a successful world tour in support of Blackbird, recording their December 7, 2008 show at the Heineken Music Hall in Amsterdam, Netherlands for a live DVD titled Live from Amsterdam. A single disc version was sold exclusively at venues during the Creed reunion tour in 2009 and on Amazon.com. Released to extremely positive reviews, the DVD sold "thousands and thousands" of copies as opposed to the projected "hundreds" that Amazon expected to sell, reached No. 1 on Amazon's "Bestsellers in Music Videos & Concerts," and remained there for several weeks. A Blu-ray Disc version and a deluxe edition released in stores in North America on January 11, 2011. Alter Bridge took a break in 2009 following Creed's reunion tour and new album. While Tremonti, Marshall, and Phillips were touring with Scott Stapp as Creed, Kennedy worked on his first solo album and began working extensively with Guns N' Roses and Velvet Revolver lead guitarist Slash, and later touring with Slash throughout 2010 and 2011 as his lead vocalist. Alter Bridge began the recording process of their third album from February through May 2010. On July 17, 2010, Billboard reported that Alter Bridge had signed with Roadrunner Records and that the band would embark on a spring tour with Godsmack in 2011. While the latter report was later denied by the band, Alter Bridge revealed the title of their new album, AB III, along with the track listing on their official website in early August. Roadrunner Records confirmed that the band had signed with them and gave the release date of their new album as October 8, 2010. The first single "Isolation" was released on Roadrunner's website on September 6, 2010. The song became the band's most successful song, reaching No. 1 on active rock radio and on the Hot Mainstream Rock Tracks chart, a first for Alter Bridge. AB III was released in Australia and Germany on October 8, 2010 and in the United Kingdom on October 11, 2010 by Roadrunner Records and in North America on November 9, 2010 on the band's own vanity label, Alter Bridge Recordings, via EMI. The album debuted at No. 17 on the Billboard 200. The music video for "Isolation" premiered on Noisecreep on December 6, 2010. On January 11, 2011, the band finally released its long-awaited live album and concert film, Live from Amsterdam, in stores. Also, "I Know It Hurts" was later released as the second single, in Australia only, on January 21, 2011. "Ghost of Days Gone By" was released as the next single on April 18, 2011, followed by "Wonderful Life" on June 5, 2011 in the United Kingdom. The band advertised that AB III would be much "darker" than and a lyrical departure from their previous albums, and the album was confirmed to be constructed as a loose concept album. AB III was met with "overwhelming critical acclaim" from professional reviewers upon its release, with MusicRadar calling it "one of the guitar albums of the year." Artistdirect gave AB III a perfect score and called it a "masterpiece." Also, a tribute album to Alter Bridge titled String Tribute to Alter Bridge, which features instrumental classical arrangements of various Alter Bridge songs, was made available on March 8, 2011. On October 25, 2011, Alter Bridge released a special edition of AB III titled AB III.5, which includes three bonus tracks and an hour-long documentary titled One by One. The band started touring in support of AB III in the fall of 2010 in the United Kingdom with Slaves to Gravity appearing, followed by a tour of the United States with Taddy Porter and Like a Storm. In the spring of 2011, Alter Bridge toured the United States again, this time with Black Stone Cherry and Like a Storm. Alter Bridge performed at several European festivals in the summer of 2011, including the Rock am Ring and Rock im Park festivals, the Nova Rock Festival, the 2011 Download Festival, the 2011 Hellfest Summer Open Air, and several others. Alter Bridge performed a free concert on Jimmy Kimmel Live! on the ABC television network on April 25, 2011. The band also co-headlined the second annual Carnival of Madness Tour in summer 2011 with Theory of a Deadman, with supporting acts Black Stone Cherry, Adelitas Way, and Emphatic. The tour was extended until January 2012, when the band played select dates in Australia, including the Soundwave Festival. The band released a series of webisodes produced by DC3 Music Group detailing their tour. In addition, a second concert film titled Live at Wembley was recorded on November 29, 2011, at Wembley Arena, the band's largest headline show up to that point. It was released worldwide on March 26, 2012, and it will later be released in 3D. In 2012, the instrumental members of Alter Bridge turned their attention to their other band, Creed, embarking on a tour. Tremonti emphasized that he is always writing music for both Creed and Alter Bridge. Myles Kennedy turned his attention to his project with Slash, releasing Apocalyptic Love (2012), while Mark Tremonti released a solo album All I Was (2012). Phillips joined a new band called Projected with Sevendust members John Connolly and Vinnie Hornsby, and former Submersed guitarist Eric Friedman, releasing an album called Human. The band returned with Fortress in 2013, which was followed by a European tour and festival dates. Members of Alter Bridge met in December 2012 to discuss the next album and the future tour of the band. They entered the studio in January 2013 to begin recording the new album, while touring intermittently with their respective side projects. Recording continued in late April 2013 and lasted till July 2013 with their producer Michael "Elvis" Baskette. The album was confirmed to be called Fortress. On July 31, 2013, Alter Bridge revealed album cover and track listing for Fortress, and the first single, "Addicted to Pain", was officially released on August 12, 2013. Mark Tremonti said that the band tried to "challenge ourselves to get the most out of the arrangements" and that the album is a "high energy record". The band streamed the album in its entirety on the Metal Hammer website as a UK exclusive on September 23. Fortress was released everywhere by September 30, 2013 except in the US, where it was released on October 8. The album received critical acclaim, with Allmusic saying "Fortress is a driving album that not only doesn't feel tired or stale, but is a monster of an album that makes a pretty solid case for being some of Alter Bridge's strongest and most dynamic work to date." Their second and third singles "Cry of Achilles" and "Waters Rising" performed relatively well at the charts, achieving 27 and 15 place at US Hot Mainstream Rock Tracks. A headline tour of the UK and Europe in support of Fortress with Halestorm and Shinedown commenced on October 16 in Nottingham. Two weeks prior to this the band played a single show in the US, at the House of Blues in Orlando. Alter Bridge played at the Australian music festival, Soundwave in 2014 as an Australian leg of the tour, and also headlined several concerts in fall 2014, including Louder Than Life Festival in Louisville, and continued through the end of the month. They selected California Breed to open dates for them on their October run. In January 2014, Alter Bridge had planned to release a box set titled Alter Bridge X to commemorate the band's 10th anniversary. The 27-disc collection included all four albums, both concert films, exclusive uncut interviews, every music video, previously unreleased songs and live footage, an autographed poster, and a coffee table book about the history of the band. Only 3,000 copies were made; however, the project experienced significant delays and was not released until September 2014. In March 2014, a Live in Milan CD and DVD package, similar to that of Live in Amsterdam and Live at Wembley documenting a live show from their recent Fortress Tour, was set for release in June 2014 but later scrapped due to sound issues. Alter Bridge released its fifth album The Last Hero in October 2016. In January 2015, the band stated that they would not tour that year but release a new album in 2016. In January 2016, after members of the band had finished working on other projects throughout 2015, Alter Bridge officially began recording their fifth studio album. The record would again be produced by Michael "Elvis" Baskette. The band started selling memorabilia items and goods such as lyrics sheets, used guitar straps, postcards, drumsticks and guitars used for recording the album through Fret 12, a company associated with Tremonti. The band joined Disturbed and Breaking Benjamin on a U.S. tour in the summer of 2016. Tremonti said in May that the band was aiming for a September 2016 release for the new album. Regarding the sound of the album, Tremonti said, "I think it's a good mixture between Fortress and Blackbird; it covers all bases." In June 2016, Alter Bridge signed with Napalm Records for the international release of the album, and later announced they would headline a 2016 United Kingdom tour with Volbeat, Gojira, and Like a Storm. On July 6, 2016, the band revealed the new album's title as The Last Hero; it was released on October 7, 2016. They embarked on a US and Canada Tour in January and February 2017. After that the band toured Australia and New Zealand in early April and returned for three shows in May. In June they embarked on a European Tour, headlining Rock am Ring and Rock im Park, Download Festival and Hellfest. The band played in Ireland for the first time ever in June 2017 and Argentina for the first time in September. Alter Bridge released their third live album, Live at the O2 Arena + Rarities, on September 8, 2017, which includes a compilation of bonus tracks from previous albums, including two previously unreleased songs that were recorded in 2004. The band played two shows at the Royal Albert Hall on October 2–3, 2017, alongside the 52-piece Parallax Orchestra as part of another European Tour, with the shows recorded and released on CD/Vinyl/DVD/Blu-Ray release on 7 September 2018. They played 14 dates in the US throughout November and December with support from All That Remains as part of the final installment of the tour supporting The Last Hero. Alter Bridge's music is often characterized and described as "heavy, yet melodic." Their music has been listed under several genres including hard rock, heavy metal, alternative metal, progressive metal and post-grunge. Alter Bridge's music is co-written by Kennedy and Tremonti and arranged by Alter Bridge; the band's lyrics are written primarily by Kennedy, although Tremonti wrote most of the lyrics and all of the music on One Day Remains. The lyrics on the first two Alter Bridge albums mainly touch on hope and overcoming regret, sadness, grief, loneliness, pain, and addiction. The subject matter on their third release, AB III, is noticeably darker, with lyrical themes mostly based on struggling with faith and a loss of innocence. Often recognized for their live performances, the band generally does not perform in larger venues such as arenas and amphitheaters outside of the UK. Instead, they regularly play smaller venues such as House of Blues, as was their intention from the start. Myles Kennedy said in an interview with Artistdirect, "We're definitely a live band. That's what it's all about for us. We make records so we can go out and play for people." The band has been joined on stage by several surprise guests, including Slash, Paul Reed Smith, Wolfgang Van Halen, and Eric Friedman, and several other notable musicians, such as Eddie Van Halen, Jimmy Page, and John Paul Jones, have been reported to have attended an Alter Bridge concert. Alter Bridge's live performances are generally praised. 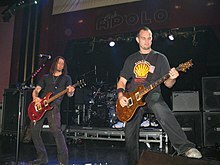 In early 2010, Alter Bridge joined the Wheelchair Foundation, DC3 Music Group, and other artists including Scott Stapp (retired as vocalist of Creed), Godsmack, David Archuleta, and New Kids on the Block to assist in the "Plane to Haiti" project, a relief effort to help the victims of the 2010 Haiti earthquake. The band also joined the fight against cancer in 2011 by helping the "Play for Life" organization raise funds for City of Hope Medical Center, a leading research center for cancer. In October 2010, the band's song "Ties That Bind" from Blackbird was listed by Total Guitar as the 41st greatest guitar song of the decade, with Ultimate Guitar Archive naming AB III the seventh best album of 2010 that December. In March 2011, the dual guitar solo in the critically acclaimed song "Blackbird" was named the greatest guitar solo of all time by Guitarist, ahead of tracks by artists such as Led Zeppelin, Guns N' Roses, Van Halen, Pink Floyd, and others. Myles Kennedy responded by saying that he was "a little uncomfortable with the idea that it was voted the 'best,'" but he and Mark Tremonti both stated that they were honored. Later, in May 2011, the band defeated Avenged Sevenfold, Linkin Park, Three Days Grace, and other artists in Fuse TV's "Battle of the Fans" poll. The tournament peaked at 7.2 million votes. Alter Bridge's first album, One Day Remains, received mixed reviews upon its initial release, with many criticizing its sound as being too similar to that of Tremonti, Marshall, and Phillips' former band, Creed. Despite this, it was certified gold by the RIAA on November 8, 2004 and remains the band's only RIAA-certified album. Since then, the band's subsequent albums have received general acclaim. The band's 2009 live album and concert film, Live from Amsterdam was also well received; it was originally released via Amazon.com, where on October 22, 2009, it rose 15,000 spots on Amazon's "Bestsellers in Music Videos & Concerts" chart in just eight hours, rising ahead of artists such as Michael Jackson and Bon Jovi to No. 1 where it remained for several weeks. This was done with no official promotion or record label support. Alter Bridge performing at Rock am Ring in 2017. ^ a b c Joe D'Angelo (June 8, 2004). "Life After Creed: Alter Bridge Look To A Stapp-Free Future". MTV News. Archived from the original on June 29, 2011. ^ a b "Alter Bridge – Biography". VH1. ^ Joe D'Angelo (June 4, 2004). "Mark Tremonti blames tensions between band, singer Scott Stapp". MTV. ^ Johnny Loftus. "One Day Remains – Alter Bridge". Allmusic. ^ Scott Shelter. "Alter Bridge: One Day Remains". Slant Magazine. ^ "RIAA Searchable database – Gold and Platinum". Recording Industry Association of America. Archived from the original on September 24, 2015. Retrieved August 29, 2010. ^ "Alter Bridge Album & Song Chart History". Billboard. ^ Russ Breimeier. "One Day Remains, Christian Music Reviews". The Fish. ^ "WWE RAW RESULTS". August 29, 2005. Archived from the original on August 14, 2010. Retrieved December 6, 2010. ^ "Alter Bridge Biography on ActiveMusician". AciveMusician. Archived from the original on July 17, 2011. Retrieved July 13, 2010. ^ "Elektra: The Album Soundtrack CD". Marvel Comics. ^ "Fantastic Four – The Album Soundtrack". Amazon.com. ^ "Alter Bridge - Fan EP". Discogs. Retrieved December 10, 2018. ^ a b "ALTER BRIDGE Part Ways With WIND-UP RECORDS". Blabbermouth.net. April 28, 2006. Archived from the original on June 22, 2008. ^ Herndon, Jessica (April 27, 2009). "Band Creed Reunites for New Album". People. Archived from the original on April 28, 2009. Retrieved April 29, 2009. ^ "ALTER BRIDGE Signs With UNIVERSAL REPUBLIC". Blabbermouth.net. July 9, 2007. Archived from the original on February 1, 2013. ^ "ALTER BRIDGE: New Album Title, Release Date Announced". Blabbermouth.net. July 19, 2007. Archived from the original on August 25, 2007. ^ ""Watch Over You (Celebrity Rehab 2)" by Alter Bridge". VH1. ^ "Watch Over You (Duet With Christina Scabbia) – Single". iTunes Store. ^ a b "Blackbird Review". Ultimate Guitar Archive. ^ a b "Greatest solo poll: Alter Bridge speak". Guitarist. MusicRadar. March 21, 2011. Archived from the original on April 7, 2012. ^ a b c "ALTER BRIDGE TO RELEASE FIRST-EVER LIVE DVD 'LIVE IN AMSTERDAM'". Road Crew Mag. Archived from the original on March 10, 2012. Retrieved October 22, 2017. ^ "Alter Bridge Live From Amsterdam". Universal Republic. ^ Alter Bridge (October 26, 2010). "Alter Bridge – Live in Amsterdam No. 1 in Concert/Music DVD's on Amazon". Archived from the original on August 14, 2010. ^ a b Alter Bridge. "Alter Bridge – Live From Amsterdam – OUT NOW USA/Canada". Archived from the original on January 14, 2011. ^ Joe Bosso (February 7, 2010). "Slash picks Alter Bridge's Myles Kennedy for solo tour". MusicRadar. Retrieved August 9, 2016. ^ Alter Bridge (February 16, 2010). "Recording of AB III Starts Today (With Photos)". Archived from the original on July 31, 2010. ^ Alter Bridge (May 11, 2010). "Alter Bridge in New York – Finalizing Mixing of Third Album". Archived from the original on May 21, 2010. ^ Gary Graff (July 17, 2010). "Creed Hits the Studio Before Launching Summer Tour". Billboard. ^ Alter Bridge (August 9, 2010). "New Alter Bridge Album's Title and Tracklisting". Official Alter Bridge website. Archived from the original on August 25, 2010. ^ Roadrunner Records (August 31, 2010). "ROADRUNNER WELCOMES ALTER BRIDGE". ^ "HEAR A BRAND NEW TRACK FROM ALTER BRIDGE". Roadrunner Records. September 6, 2010. ^ a b Alter Bridge (December 18, 2011). "Alter Bridge Press Release – Isolation Goes No. 1 on Rock Radio". Alter Bridge. Archived from the original on January 22, 2011. ^ "AB III to Hit Stores in USA November 9th Featuring Hit Single "Isolation"". Alter Bridge's blog. October 6, 2010. Archived from the original on October 14, 2010. Retrieved October 6, 2010. ^ "Alter Bridge Focus on the Fans for 'Isolation'". Noisecreep. December 6, 2010. ^ "I Know It Hurts – Single". iTunes. ^ "ALTER BRIDGE Teams Up With ABBEY ROAD LIVE For Upcoming Tour". Blabbermouth.net. March 24, 2011. Archived from the original on September 7, 2012. ^ "Alter Bridge – Wonderful Life – Roadrunner Records UK". Roadrunner Records. Archived from the original on September 9, 2011. ^ a b Alter Bridge. "New Alter Bridge biography". Archived from the original on August 5, 2011. ^ Rob Laing (September 17, 2010). "Alter Bridge – AB III: Track-by-track review". MusicRadar. Future Publishing Limited. Retrieved October 4, 2010. ^ Florino, Rick (October 12, 2010). "Alter Bridge "AB III" Review — 5 out of 5 Stars Review". Archived from the original on October 14, 2010. Retrieved October 12, 2010. ^ "String Tribute to Alter Bridge". Bestbuy.com. Retrieved July 17, 2011. ^ "ALTER BRIDGE: 'AB III.5' CD/DVD Special Edition Detailed". Blabbermouth.net. September 21, 2011. Archived from the original on September 18, 2012. ^ "Alter Bridge Tour Dates – Alter Bridge Concert Schedule". Eventful.com. ^ "Alter Bridge updates fans on Twitter". Twitter. January 28, 2011. ^ Alter Bridge (January 28, 2011). "Alter Bridge AB III USA Spring Tour – First Dates Announced". Alter Bridge. Archived from the original on January 31, 2011. ^ Alter Bridge (February 3, 2011). "New USA Spring Tour Date + Like A Storm Added to Bill". Alter Bridge. Archived from the original on February 6, 2011. ^ Alter Bridge (January 13, 2011). "Alter Bridge to Rock German Festivals in June". Alter Bridge. Archived from the original on January 16, 2011. ^ "Schon 60.000 Eintrittskarten für Ring und Park verkauft". Rock am Ring. January 13, 2011. Archived from the original on January 16, 2011. ^ Alter Bridge (January 19, 2011). "Alter Bridge to Play Nova Rock Festival (Austria) in June". Alter Bridge. Archived from the original on January 22, 2011. ^ "NOVAROCK – HOME". Nova Rock Festival. ^ "Line Up – Download Festival". Download Festival. ^ Alter Bridge (January 27, 2011). "Alter Bridge to Rock Hellfest (France) in June". Alter Bridge. Archived from the original on January 30, 2011. ^ Alter Bridge (February 16, 2011). "Press Release – Jimmy Kimmel, New Video & Tour News". Alter Bridge. Archived from the original on February 19, 2011. ^ "THE SECOND ANNUAL "CARNIVAL OF MADNESS" PRESS RELEASE". Facebook. May 23, 2011. ^ "Alter Bridge to Rock Australia in Early 2012". Alter Bridge. September 19, 2011. Archived from the original on November 26, 2011. ^ "Alter Reality". Alterbridge.com. Archived from the original on July 24, 2014. Retrieved July 15, 2014. ^ Amy Sciarretto (November 11, 2011). "Alter Bridge to Film Show at Wembley Arena For DVD Release". Artistdirect. ^ "Alter Bridge 'Live at Wembley' DVD Update from Director". Audio Ink Radio. March 17, 2012. ^ "Alter Bridge to release live album and DVD 'Live At Wembley' next year". NME. December 27, 2011. ^ Joe Bosso (May 13, 2011). "Mark Tremonti on solo album, Alter Bridge, instructional DVDs and Creed". MusicRadar. ^ Wayne Bledsoe (May 5, 2011). "Alter Bridge had to cut its own road after Creed". Knoxville.com. ^ "SEVENDUST, ALTER BRIDGE Members Join Forces In PROJECTED". Blabbermouth.net. Roadrunner Records. February 2, 2012. Archived from the original on July 30, 2012. Retrieved March 9, 2012. ^ "Alter Bridge Planning New Studio Album, World Tour". Ultimate Guitar Archive. December 13, 2012. Retrieved December 13, 2012. ^ "tremonti – workaholic for rock". entertaim.net. February 25, 2013. Retrieved February 25, 2013. ^ Bowar, Chad. "Alter Bridge begin recording fourth album". Loudwire. Retrieved April 30, 2013. ^ "Alter Bridge Unveil Cover Art + Track Listing for 'Fortress'". Loudwire.com. July 31, 2013. Retrieved July 15, 2014. ^ "Alter Bridge To Unleash New Album 'Fortress' in October". Loudwire.com. July 24, 2013. Retrieved July 15, 2014. ^ "Fortress – Drops October 8th (USA)". Alter Bridge. Archived from the original on July 18, 2014. Retrieved July 15, 2014. ^ "Fortress – Drops September 30 (UK)". Alter Bridge. Archived from the original on February 4, 2014. Retrieved July 15, 2014. ^ "Mark Tremonti Italia | Il primo ed unico sito italiano dedicato a Mark Tremonti". Marktremonti.it. Retrieved July 15, 2014. ^ Gregory Heaney (October 8, 2013). "Fortress – Alter Bridge | Songs, Reviews, Credits, Awards". AllMusic. Retrieved July 15, 2014. ^ "2013 Alter Bridge European/UK Tour". Alter Bridge. Archived from the original on July 21, 2014. Retrieved July 15, 2014. ^ "Alter Bridge Reveal Fall 2014 U.S. Tour Dates". Loudwire.com. Retrieved July 9, 2016. ^ "> News > ALTER BRIDGE Upload Orlando Webisode; 10th Anniversary Box Set Trailer". Bravewords.com. Retrieved July 15, 2014. ^ "> News > Massive 10th-Anniversary ALTER BRIDGE Box Set Arrives". Blabbermouth.net. Retrieved September 30, 2014. ^ "> News > ALTER BRIDGE – Live In Milan CD, DVD, Blu-Ray Due In June". Bravewords.com. Retrieved July 15, 2014. ^ Michael Tremonti (February 11, 2016). "Michael Tremonti tweet re Milan DVD". Twitter. Retrieved October 9, 2017. ^ "Alter Bridge Begins Work On New Album". Blabbermouth.net. January 7, 2016. Retrieved July 9, 2016. ^ "Join Disturbed and Breaking Benjamin on Summer 2016 Tour". Alter Bridge. Archived from the original on July 15, 2016. Retrieved July 9, 2016. ^ "TREMONTI – "People Who Think They're The Best, Die Just Like The Rest"". Bravewords.com. Retrieved July 9, 2016. ^ "Alter Bridge Sign to Napalm Records Ahead of New Album". Loudwire.com. June 6, 2016. Retrieved July 9, 2016. ^ "Alter Bridge Return To Headline UK Arenas On Nov 2016 Tour". Rocksins.com. Retrieved July 9, 2016. ^ "Alter Bridge To Release 'The Last Hero' Album In October". Blabbermouth.net. April 17, 2013. Retrieved July 9, 2016. ^ "Upcoming Dates". Archived from the original on October 2, 2017. Retrieved January 18, 2018. ^ Stephen Hill (September 7, 2017). "Alter Bridge - Live At The O2 Arena + Rarities album review". Team Rock. Retrieved October 9, 2017. ^ Scott Munro (July 12, 2017). "Alter Bridge to play symphonic shows at the Royal Albert Hall". Team Rock. Retrieved October 5, 2017. ^ Dom Lawson (October 3, 2017). "Alter Bridge review – a stunning, symphonic metal band reborn". The Guardian. Retrieved October 5, 2017. ^ Chad Childers (July 13, 2018). "ALTER BRIDGE TO UNLEASH ORCHESTRAL POWER IN 'LIVE AT THE ROYAL ALBERT HALL' RELEASE". Loudwire. Retrieved February 16, 2019. ^ "Alter Bridge And All That Remains Announce Fall Tour (Week in Review)". antiMusic. Retrieved October 9, 2017. ^ "AN INTRODUCTION TO ALTER BRIDGE WITH MYLES KENNEDY". Roadrunner Records. September 30, 2010. ^ allmusic ((( Alter Bridge > Overview ))) Allmusic. ^ Rick Florino (October 11, 2010). "Myles Kennedy of Alter Bridge Talks "AB III," Slash and John Irving". Artistdirect. Rogue Digital, LLC. Archived from the original on November 13, 2010. Retrieved October 20, 2010. ^ "AB III Review". Ultimate Guitar Archive. ^ Sharon Mawer. "Blackbird – Alter Bridge". Allmusic. ^ "New Interview with Myles Kennedy of Alter Bridge". They Will Rock You. November 17, 2010. Archived from the original on December 13, 2010. Retrieved December 6, 2010. ^ "Myles Kennedy of Alter Bridge Talks "Field of Dreams," Solo Record and "AB III"". Artistdirect. October 11, 2010. ^ Rick Florino (November 29, 2010). "Myles Kennedy of Alter Bridge Talks "Field of Dreams," Solo Record and "AB III"". Artistdirect. ^ "SLASH Joins ALTER BRIDGE On Stage In Stockholm". Blabbermouth.net. November 2, 2010. Archived from the original on November 6, 2010. ^ Johnnie Vrana (December 18, 2010). "Paul Reed Smith & Alter Bridge @ Rams Head Live 12-16-2010". Shockwave Magazine. ^ "WOLFGANG VAN HALEN Playing Drums For ALTER BRIDGE; Video Available". Blabbermouth.net. January 7, 2011. Archived from the original on January 10, 2011. ^ "Eddie & Wolfgang Van Halen attend Alter Bridge concert, Wolfgang joins in on drums". Van Halen News Desk. January 5, 2011. ^ Steve Sauer (November 10, 2008). "Source: Page, Jones, Bonham watch Alter Bridge in London; DVD filming postponed". LedZeppelinNews.com. Archived from the original on April 5, 2016. ^ "DVD Review: Alter Bridge: Live From Amsterdam". The Audio Perv. December 25, 2009. ^ "Alter Bridge Live Review From London's Wembley Arena". Rock Sins. October 2013. ^ "Alter Bridge, Halestorm and Shinedown: Wembley Arena, London – live review". Louder Than War. October 23, 2013. ^ "NO STOPPING ALTER BRIDGE AT A SOLD OUT BEST BUY THEATER". Local Bozo. April 24, 2014. ^ "ALTER BRIDGE STILL BRINGING IT ON 2014 U.S. FALL TOUR". The Rock Revival. Retrieved July 9, 2016. ^ Benjy Eisen (January 26, 2010). "Scott Stapp Waiting in Port-Au-Prince for 'Plane to Haiti' Relief Effort". Spinner.com. ^ "Play For Life – AUCTION: ALTER BRIDGE". Play for Life. Archived from the original on May 5, 2011. ^ Matthew Parker (October 8, 2010). "The 50 Greatest Riffs Of The Decade". Total Guitar. Archived from the original on July 14, 2011. ^ Samuel Agini (December 24, 2010). "UG Top Ten Albums Of 2010". Ultimate Guitar Archive. Archived from the original on March 10, 2011. ^ "Greatest solo poll: Alter Bridge speak, page 2". Guitarist. MusicRadar. March 21, 2011. Archived from the original on October 5, 2013. ^ "Battle of the Fans | Rockers". fuse.tv. Archived from the original on May 18, 2011. Retrieved July 17, 2011. ^ "Gold & Platinum Search "Alter Bridge"". Recording Industry Association of America. Retrieved July 7, 2018. Wikimedia Commons has media related to Alter Bridge. "Ghost of Days Gone By"
This page was last edited on 22 April 2019, at 21:59 (UTC).